We are leading manufacturer, exporter and supplier of Spare Parts for Stenter Machine like Gear Box Parts with international standard from last 25 years from India. We manufacturer and supply all type of Stenter Machine Chamber and Gearbox parts / assembly. 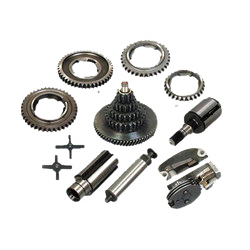 We deal in a wide range of Gear Box Parts with best quality, also for gear, chain sprocket, elevator gearbox, spur gear and many more. From last 25 years we are in manufacturing business of gear box parts which are incorporated into textile machinery per your requirement. We are in production business of textile gears and gear assemblies like, all types of Spur Gears /Helical Gears /Worm and Worm Wheel / Rack and Pinion, Internal / external Ratchet, Sprocket and Timing Belt Pulleys. We manufacturer and supply all type of Stenter Machine Chamber and Gearbox parts / assembly.